This story is a collaboration between National Native News and High Country News. In Gallup, New Mexico, onlookers lined the streets for the 97th annual Gallup Inter-Tribal Indian Ceremonial. Parades, powwows and other events draw Navajo citizens and tourists to the border town. This year it brought pageant queens in sashes and crowns, Pueblo deer and eagle dancers, and Navajo Nation presidential hopefuls, 18 in total, in full campaign mode. “I’m not going out there promising things to the people — I need their help,” said Vice President Jonathan Nez as he and his wife pushed a stroller through the night parade. 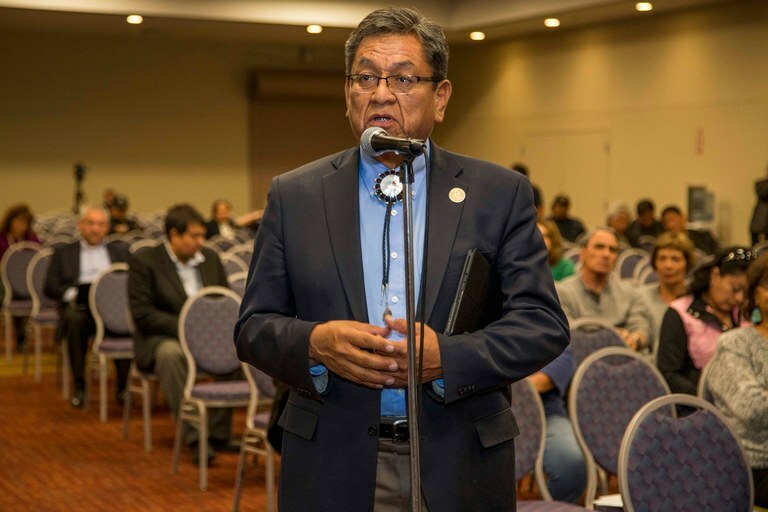 “I know they understand because we have great support from the grassroots.” Nez is running against current Navajo President Russell Begaye, who is seeking a second term in office. On Tuesday, voters will head to the primaries to narrow down the crowded field to just two candidates to lead the tribe of more than 300,000 citizens. Jonathan Nez, current Navajo Nation vice president, campaigns at the 97th annual Gallup Inter-Tribal Indian Ceremonial parade in Gallup, New Mexico. Nez is running for president in the August primary. The Navajo Nation, which has the largest reservation in the U.S. at more than 27,000 square miles across four states, is a nation in flux. More than 800 jobs and nearly $18 billion in revenue hang in the balance as the nation’s coal industry goes into freefall and officials fight to stop the 2019 closure of the Navajo Generating Station. The Navajo Nation has yet to elect a woman to the position of president, but this year Hope MacDonald LoneTree, Emily Ellison and Trudie Jackson vie for the position. This election is the first since 52,000 Navajo citizens were purged from the tribe’s voting rolls earlier this year, disenfranchising students, urban voters and others who did not participate in the 2014 or 2016 elections. The Navajo Nation’s economy is a major campaign issue due to the precarious future of the Navajo Generating Station. The station is Indian Country’s largest coal-fired power plant, providing energy to California, Nevada and Arizona. Its impending closure is expected to gut the Navajo economy. Candidates understand this. “The power plant has built families, built careers,” said presidential hopeful Dineh Benally, whose first job was at the plant. His position: find a way to keep the plant open while transitioning to renewable energy and increasing agricultural development through hemp production. Another big issue in the election is clean water. Approximately half of Navajo households have no indoor plumbing despite more than $100 million in funding for water projects. Voters hope the next president will take action. “I waited 30 years to get running water, my (late parents) never had water, they never had electricity,” said Marian Skye, a retired school nurse from Houck, Arizona. Current Navajo Nation President Russell Begaye hopes to claim a second term in November. Here he is pictured at a 2016 listening session. Skye is likely voting for Jonathan Nez, a top contender according to exit polls conducted by the Diné Policy Institute, along with Tom Chee and former Navajo president Joe Shirley Jr. Other voters, like former Marine Leland Tom, remain unconvinced. “During the election they give us promises of what they’re going to do, but it’s never done,” he said. 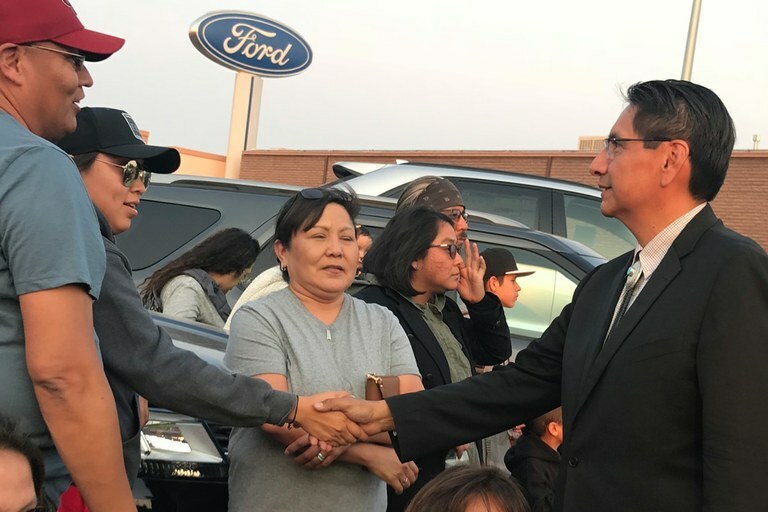 Calvin Lee, another candidate hoping to attract voters at the parade, touted education as his number one priority to create a workforce for manufacturing and technology jobs on the Navajo Nation. “I’ve been in government, I’ve been in the corporate world, been a small business owner,” said Lee. Voter turnout at the Navajo Nation’s 110 polling sites is typically less than 50 percent. As of this month, more than 93,400 voters were registered. But under Navajo law, citizens who did not vote in the 2014 or 2016 elections were purged from the voting rolls, and had until late July to reregister. Voter registration reopens Sept. 10, well after the primary has finished but before the Nov. 6 election. Critics of the law say the damage may already be done. Officials at local chapter houses, governing bodies similar to states, worry Navajo citizens could be discouraged from participating in this election or future ones. 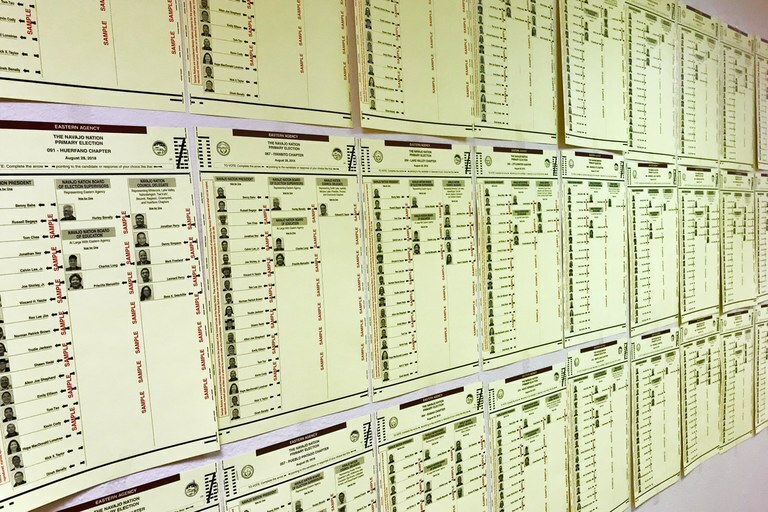 Sample ballots for the Navajo Nation primary election line the wall at the tribe’s election office in Window Rock, Arizona. Charlene Wallace, Cottonwood Chapter coordinator, raised issue with the purge, particularly with regard to students away at college. Younger and future generations are common ground when it comes to improving the lives of Navajo citizens among voters and candidates. They see language, culture and tradition as a dominant part in the office of president. Voters will return to the polls Tuesday, Nov. 6 for the Navajo Nation’s general election. Note: This story has been updated to clarify the legal principle under which several thousand Navajo citizens were purged from tribal voting rolls earlier this year. Note: An earlier version of this story included a misspelling of the first name of Navajo Nation Vice President Jonathan Nez. The story has been corrected. Antonia Gonzales (Navajo) is a journalist for Native radio and public television based in Albuquerque, New Mexico.